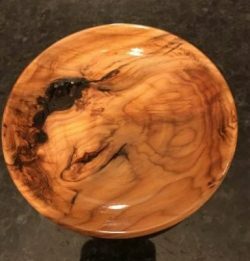 During the month of May 2019, Armagh Visitor Information Centre is delighted to host the first ever exhibition of local wood turner, Gareth Corr. Gareth says, “My love of Woodwork began at an early age, watching my father make things and carry out repairs around the house. Until I got married and left home, my bedroom was stocked full of saws and chisels for all my future projects. When my wife and I purchased our home, my tool collection expanded into power tools and some light machinery. Now that I had the space I began to tinker! I have no formal training, just a love of making, learning as I go along, making many mistakes and fixing them. I was lucky enough to attend a woodturning course in Armagh and my love of the lathe was born. Over the years I have progressed from making pens and honey dippers to wool spinners and now my real passion, bowls. Simple bowls, letting the wood speak for itself and coloured decorative bowls where my creative side can flourish. Away from the lathe I like any projects involving wood, I have made chopping boards, charcuterie boards, wine holders, key and coat hooks and many other bespoke items. I have also tried some mixed material things like wood, steel and glass coffee tables. I hope to continue learning and growing in the craft. I think a lot of skills are now being lost to mass produced goods and I hope for a return to the days of people wanting handmade items by local people. Following the recent birth of our son I hope that one day he will be in the workshop with me and I will be able to pass some things along to him and indeed I am sure he will be teaching me new techniques and wizardry in the advancing technological age. Gareth’s fabulous work will be on display throughout the month. The Visitor Information Centre is open daily Monday to Saturday 9:00am – 5:30pm and again on Sundays from 1:00pm – 5:30pm. We welcome you to call and support this new and up and coming artisit. Perhaps you will find that perfect engagement or wedding present or that little something special for your own home!